Long periods of sitting have become a concern for those who work at a desk all day and the Amish Adjustable Standing Desks offers a stylish solution. The option to move and stretch is yours with this gorgeous desk that's available with a 1 1/4" thick live edge top. Adjust the desk from standard sitting height to standing height when you tire of sitting. Just push the button on the control panel whenever you need it. Adjusting to your comfort level is just one feature of the Amish Adjustable Standing Desk. This Amish desk is offered in five wood species including a lovely live edge. Live edge furniture is natural and unique, utilizing the natural edge of the wood that lies just beneath the bark. Live edge furniture is full of character and strength, creating a desk that is beautiful to look at as well as being a strong and durable workspace. A desk from DutchCrafters is one that will last for generations. 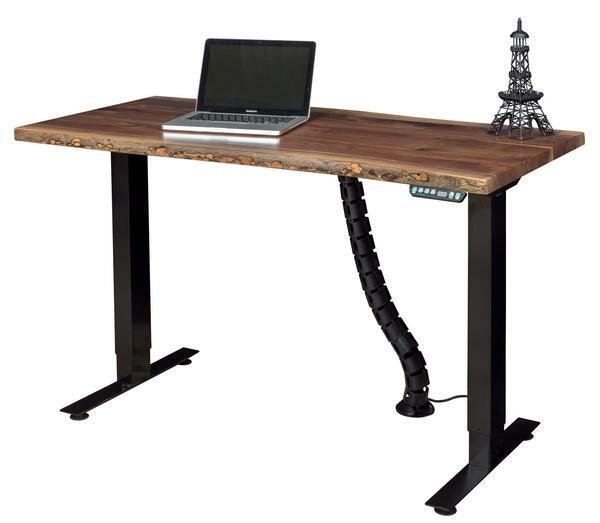 Here are some resources to help direct you to the best wood desk for your home. DutchCrafters Amish furniture takes time to build in order to bring you the quality product you're looking for. Our team of Furniture Specialists is here to answer any questions that come up from shipping to wood type. Please get in touch by phone or email. We are happy to assist you.